Posted on March 25, 2019 at 10:47 am. Overview: The Navajo Nation is the largest Native American territory in the United States, spanning more than 17 million acres in Arizona and New Mexico. Navajo Housing Authority (NHA) is responsible for managing over 10,000 housing units throughout the territory, mostly in remote subdivisions. Lack of adequate street lighting was a widespread issue within NHA subdivisions, which created safety and security concerns. NHA found that grid-connected lighting was prohibitively expensive due to the remoteness of these subdivisions, encouraging them to investigate other options to help improve lighting conditions. Our Solution: In 2015, NHA began to address this issue by working with Native Energy Solutions, a Native American–owned solar lighting distributor that provides sustainable solutions for tribal communities across the United States. Native Energy Solutions worked with Native American contractor Pimmex, which selected, purchased, and installed Sol solar lighting. By 2016, NHA had deployed 226 Sol TP systems over 12 subdivisions. NHA was very happy with the performance of the lights, so they continued to order additional Sol lighting systems. The latest order was for the EverGen M Series, the newest product from Sol: NHA ordered 315 lights for eight more subdivisions. Reliability: This was important to the Navajo Nation to ensure the lights remained working and didn’t leave the subdivision in the dark. NHA sought an established, proven solution, making Sol a good fit since the company has installed more than 80,000 outdoor lighting systems around the world. Proof of performance: The EverGen is the first Sol light to include remote monitoring, a logical feature for remote communities to check on light performance and manage maintenance plans from a distance. Lights levels: NHA also sought lighting that would meet the IES light level standards for street lighting, a feature that today’s solar street lights, including Sol’s, are able to meet and often exceed. NHA was happy with both the TP systems and the new EverGen systems. While only newly installed, they have been very pleased with the performance of the EverGen and its remote monitoring system. 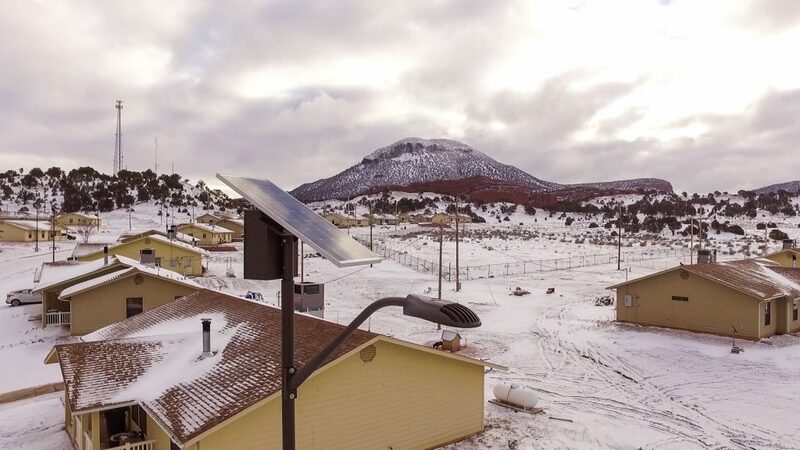 Other subdivisions within the Navajo Nation remain unlit, so NHA will continue pursuing more solar lighting projects as additional funding becomes available. This project has built a strong partnership between Sol and Native Energy Solutions, who will continue working together on future lighting projects for Native American communities across the country.